There is certainly no shortage of shabu shabu and hot pot restaurants in Orange County. However, the most unique—-and by far the healthiest——is True Seasons Organic Kitchen in Anaheim. 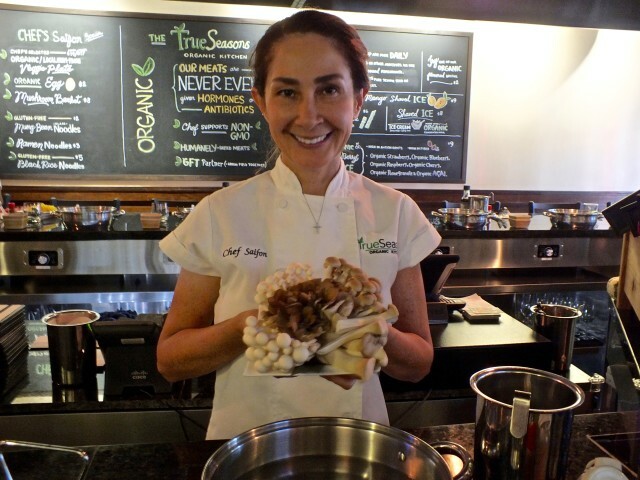 True Seasons, which just celebrated their first-year anniversary, is helmed by Chef Saifon, who is very passionate about healthful, organic ingredients and locally-sourced products. She goes 2 to 3 times a week to farmer’s markets, works closely with Seawind Farms in Fountain Valley for some of her produce and even has been known to go direct to the fishermen for fresh local seafood. “It’s my way of giving back to the farmers and it’s very nurturing for me”, Chef Saifon said of her visits. 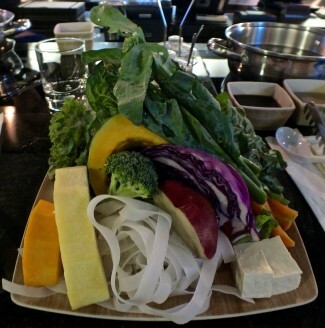 Hot pot cooking is fun, an interactive way of dining where you can tailor your bowl to your own tastes. 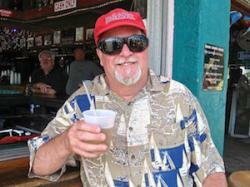 It is a perfect way to go when you have diners with specific health needs. It is easy to put a vegetarian meal together, to do a non-gluten experience or even intensify the flavors with one of their special sauces. To keep the sauces fresh, Chef Saifon makes the delicious pomegranate sauce and the addicting sesame dipping sauces twice a day. The pomegranates are fresh squeezed with skin-on to get all the nutrients and anti-oxidants available in the fresh fruit and the sesame is ground in-house for the ultimate in freshness. All meats are organic and the seafood is wild-caught and not farmed. The dining experience begins with water in your own individual hot pot at the comfortable counter. To the water, several bases can be added such as organic miso, organic spicy miso, spicy Thai lemongrass or even a gluten-free base. 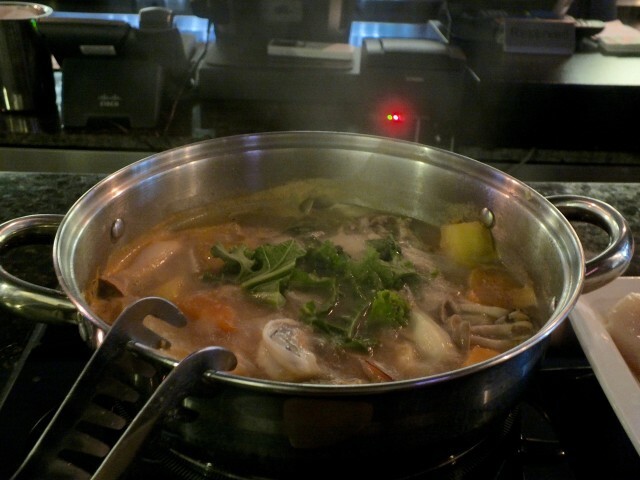 As the broth begins to boil, fresh vegetables can be added to it. The veggies vary by season, but may include items such as fresh tofu, organic kale and cabbage. On the vegetarian platter, this also includes several types of squash that have a longer cooking time. As the broth cooks, the flavor comes out into the broth. I also ordered their mushroom basket, a nice platter of fresh organic mushrooms that is simply spectacular. Added to the broth, they really fill out the flavor and bring a nice earthiness to the hot pot. Soon I was having fun dipping the leafy veggies in, swishing them around and then taking them out to dip in the sauces. The pomegranate sauce was delicious, but I noticed that I was hopelessly addicted to the sesame sauce, a spicy, garlicky combination that really brought a lot of flavor to the table. Shortly after the veggies had begun to be cooked, our plates of protein arrived. We got an assortment, including organic grass-fed beef, wild-caught shrimp, huge, beautiful scallops and organic chicken. Chef Saifon and her staff are very helpful with info regarding cooking times of each of the proteins. As each item went into the pot, the flavor of the broth just kept intensifying. The beef was tender and the scallops plump and very delicious. Items can be ordered in small, medium or large size platters and also ordered as “half and half” platters if you want to try more than one item. As my guest and I dipped our chopsticks in the broth, we had as much fun cooking the items as well as visiting. That seemed the same for the other groups of people at the counter too. As the items disappeared from our platters, Chef Saifon announced that it was time to make our soup. In went a nice helping of rice noodles, the rest of the shrimp and the balance of the mushrooms. Garlic and other seasonings were also added to the boiling broth, now thickened nicely into a hearty soup. Also added were the balance of the dipping sauces for a fresh, unique flavor. It is hard to emphasize how delicious the soup is. Just as importantly, since the soup contains the flavors you like, it is exactly what you want. It’s also important to realize that this is not only a flavorful meal, but healthy too, with lots of good ingredients and no frying. Chef Saifon is quick to point out that “Food is like a medicine to our bodies and food is also healing, but if it doesn’t taste good nobody wants to eat it”. Chef Saifon certainly takes care to ensure that her food is delicious—–and healthy too. Besides the hot pots, True Seasons Organic Kitchen has a nice variety of organic wraps, rice bowls and salad bowls. They also have some delicious drinks such as sugar cane juice, which is juiced to order for you from fresh organic sugar cane. Other drinks include Thai Iced Tea and Thai Iced Coffee, both made with organic agave. Here too, the emphasis on finding fresh, organic elements really works well in giving lots of flavor and avoiding the common misconception that healthy food is bland food. Chef Saifon, who loves spicy food, grew up in Thailand and loves good food. Growing up on a fruit and vegetable farm, however, she knows fresh food and works hard to ensure her guests have the freshest, most delicious food available. In fact, the flavors, freshness and even the fun of a hot pot meal make this one of the best places to go with friends in all the LA/OC area. 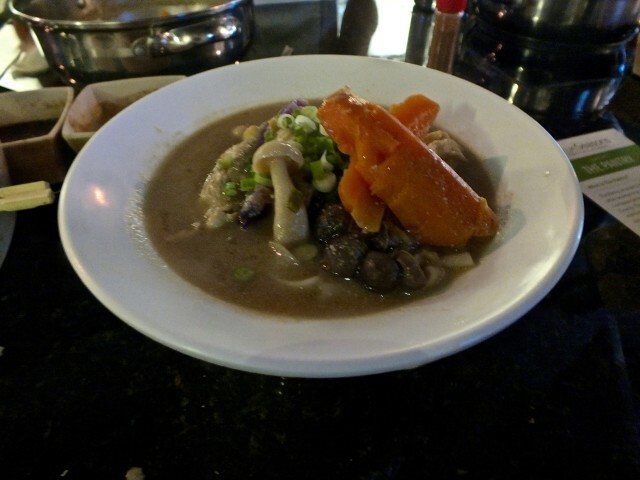 This entry was posted in Food, Health and Beauty and tagged Anaheim, Chef Saifon, Ed Simon, hot pot, organic, shabu shabu. Bookmark the permalink.